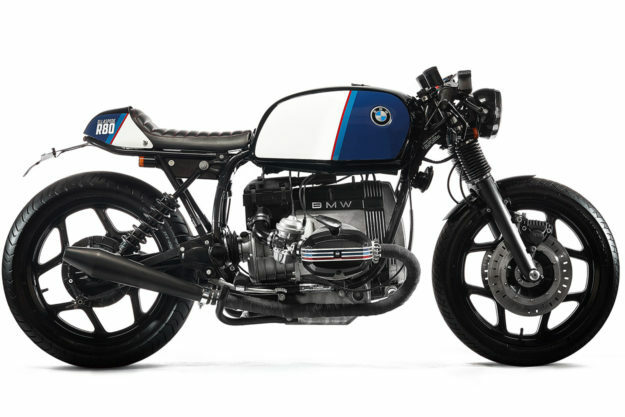 BMW R80 by Ellaspede It’s been said, many times over, that old Beemers have been done to death. It’s true that their predominance makes it hard to stand out from the crowd, but when one comes from experts like Ellaspede, we’re still gonna swoon. As Ellaspede’s Hughan Seary says, “The lines of a bike are often overlooked or misunderstood.” Obviously that isn’t the case here at all. The main angles, cut-off points and foundation of this R80 demonstrate a master class in cafe creation. Thanks to Ellaspede’s rear frame kit, most of those essentials fall exactly into place. It also enabled them to fit up their R-Series seat pan and battery box which, combined with the lowering triple clamp, nails both the swoop and bone lines of the bike. 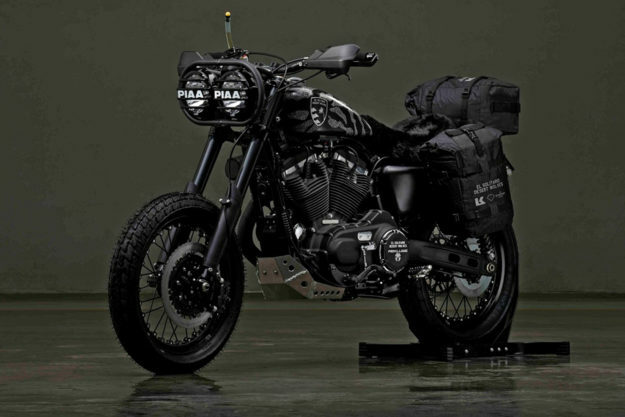 Harley-Davidson Sportsters by El Solitario MC I can hear the cracking of knuckles already. The flexing of muscles and stretching of tendons, as fingers get ready to type. 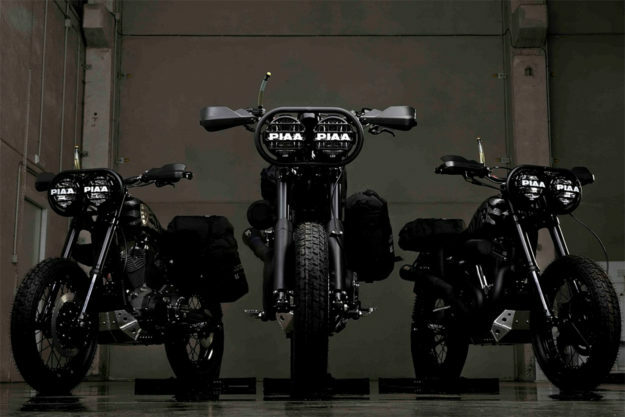 Yes, El Solitario MC have been building again. So let’s take a look at what the custom world’s most polarizing group have come up with now. 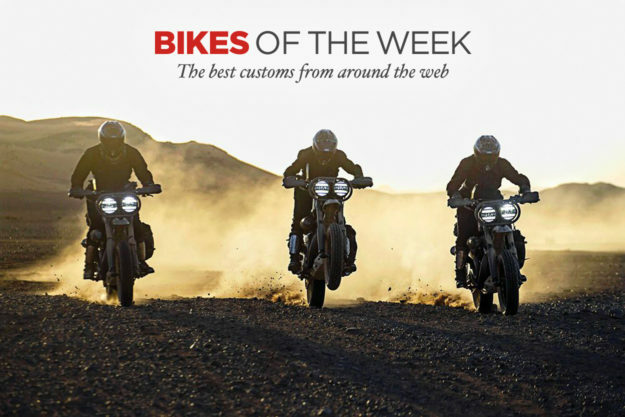 The Desert Wolves project is more than just a trio of desert sled Sportsters—but you can read about the adventure, exploits and gear it birthed elsewhere. We’re focused on the bikes. And they look seriously well sorted. Sure, taking 550 pounds of Milwaukee Iron and asking it to do the job of a 200-pounder is controversial. But the lads rode these beasts. For ten whole days. Across the Sahara, no less. To make that nightmare a reality, David Borras and his pack had to nail down performance and reliability. The main concern was the suspension, so Öhlins were tapped to sort out new internals for the front forks—and they also came up with a modified set of ATV shocks for the rear. This gave the Sporties the ground clearance they now needed, but David still had beefy skid plates fab’d up, just in case. To help cut unsprung weight, these sleds now ride on 19-inch Kineo wheels, fitted with fresh flat track rubber. Chain drive conversions and 2-into-1 custom exhausts were also fitted. Benelli 512m by Plan B Motorcycles It may look like a repli-racer but this Benelli, dubbed the 512m, actually has roots in both the four-wheeled and two-wheeled world. Plan B’s Christian Moretti calls it a celebration of speed—no surprise considering it comes from the same mind that delivered Cherry Salt. But just what about ‘speed’ does this one celebrating specifically? Well, that would be the Ferrari 512M, a car our friends at Petrolicious credit with changing the racing world forever, despite never notching up a win. Moretti shares this sentiment, so he worked his magic to transform a Benelli 354 Sport into the jaw-dropper you see here. First things first: the tiny four-banger was swapped out for a 500cc mill. The bigger motor was ported and polished, and four new flatside carbs were fitted. That gave the lightweight Benelli twice the grunt and, thanks to some liberal work with a grinder out back, it has even less mass to shunt. 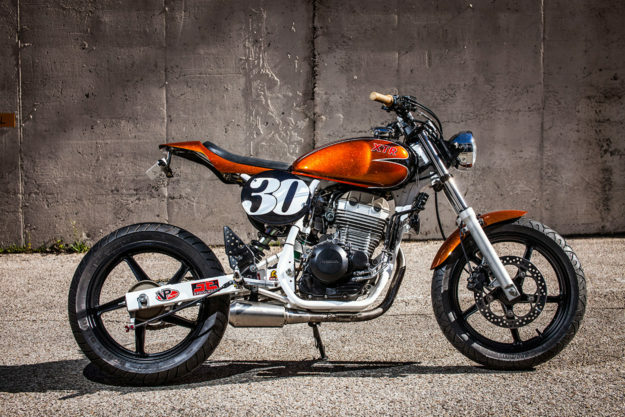 Honda CBF250 by XTR Pepo The tracker, whether in ‘street’ or full-opposite-lock ‘mudslinger’ guise, is the dominant style dictating design these days. That’s largely thanks to the resurgence of racing on American soil (and its network coverage) but the influence is being felt worldwide. Never one to be left out of a performance-based party, Pepo Rosell has just pulled the wraps off of his Tracker MK2. 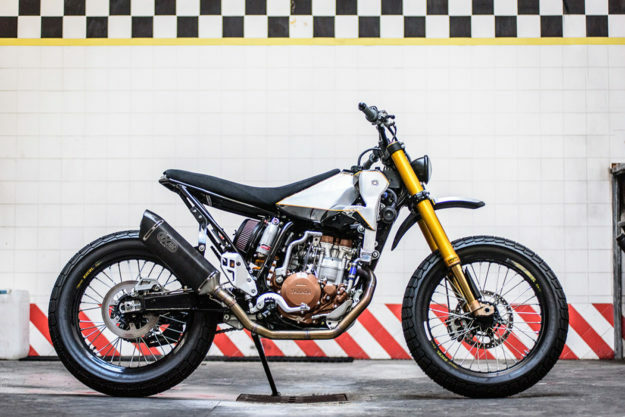 Working from a Honda CBF250, the newest XTR Pepo build is firmly planted in the street tracker phylum of bikes. Thanks to its Mash 125 headlight, NG front brakes, LED rear signals and XTR aluminum license plate bracket, scooting around the city in style shouldn’t be a problem. And that style is accented in Rosell’s typical expert fashion by a fine choice of donor parts and custom touches. Yamaha WR400 by Meccanica Serrao d’Aquino Based out of Milan, Italy Meccanica Serrao d’Aquino have quietly put together an impressive resume of restorations and custom bike builds. The latest to pop up on our radar is this Yamaha WR400 tracker that screams fun. Credit goes to Gianpaolo, the man in command at the shop. 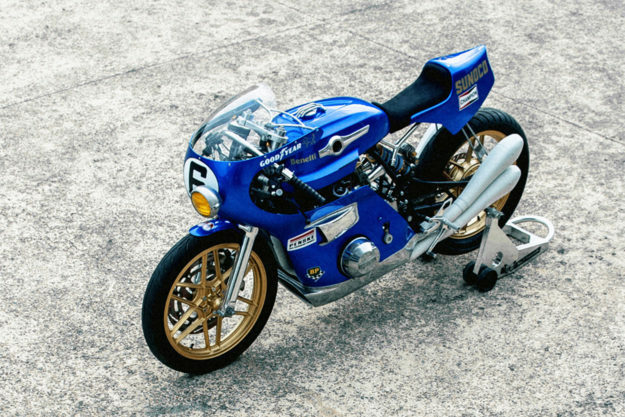 He wasn’t looking to screw around with this build, or crank out a ‘pretty’ bike: it had to be an absolute stormer around the track, too. With an already lightweight donor to work with and a dead-solid 48hp thumper at his disposal, ‘FTW400’ wouldn’t need a massive redux to compete. But Gianpaolo didn’t scrimp. The WR’s subframe has been snubbed to tidy up its rear. The airbox too has been redone, to free up breathing while adding lightness. The alloy fuel cell is a Gianpaolo original, along with many machined hard parts—like the footpegs and the mount for the custom Exan exhaust.